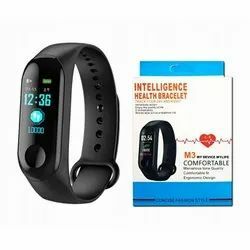 Pioneers in the industry, we offer smart fitness band m2 and smart fitness band m3 from India. 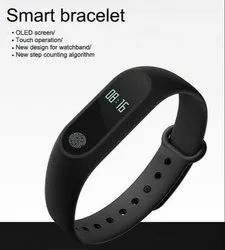 M2 water resistant smart fitness band compatible with bluetooth or heart rate sensor,it is compatible to devices having bluetooth version 4.0 and below in smart phones, tablets and pc's and also support android and ios features: OLED time display 24 formula: check the current time. Steps: record your steps. Mileage: mileage of sports. SMS: bluetooth sync reminders, sms notifications. Stand by time: 300 hours. Calories: calories of sports. Power: displays the current power. Heart rate sensor: check your heart rate. Pedometer: sports pedometer, motion odometer. Sleep monitor: at night, check the quality of sleep in app.Sedentary reminder: remind you when you don't move from one hour. Battery capacity: 70 mAh. Alarm reminder, Sensor: low-power acceleration sensor, waterproof.